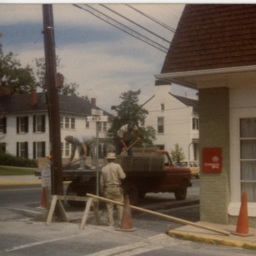 Photograph of three men performing construction work on a side walk along Main Street (US Route 11) in Woodstock Virginia. Dated September 1980. Label on rear reads "Mr. Murdock in Stocking Co Sido Walk _ Bank Main St."